An error occurred while installing json (1.7.3), and Bundler cannot continue. I'm using Windows 8. I do have c:\ruby193\bin in my path. What do I do to remedy these errors? Make sure you install the devkit (ticking the checkboxes that will update the path) : You might need to reinstall ruby too. 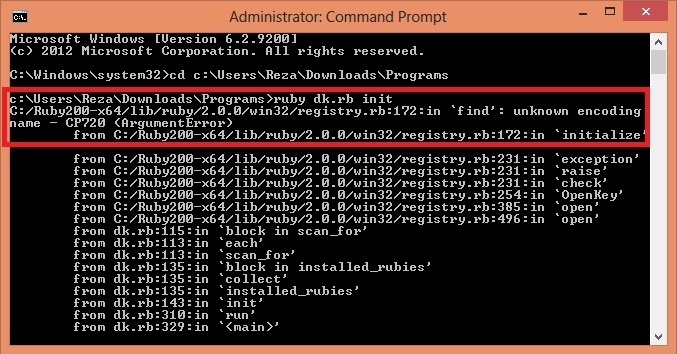 now you can run that command without problem . If you know that you have the proper DevKit installed (eg: via chocolatey), then you simply need to run the included script to set up environment variables. These scripts will set up the correct paths in your current command window. Not the answer you're looking for? Browse other questions tagged ruby-on-rails-3 json windows-8 build-tools or ask your own question. How do I get json gem 1.7.7 to Update? How do I build “gem install json”? Why am I not able to install JSON gem?